FLW Tour Pro David Dudley has won more than $2 million by catching more and bigger bass than anyone else, but he’s never caught a fish like the one he boated Tuesday, April 16, 2013. He set a new personal best, and to top it off, it was on a lure he’d never seen before. 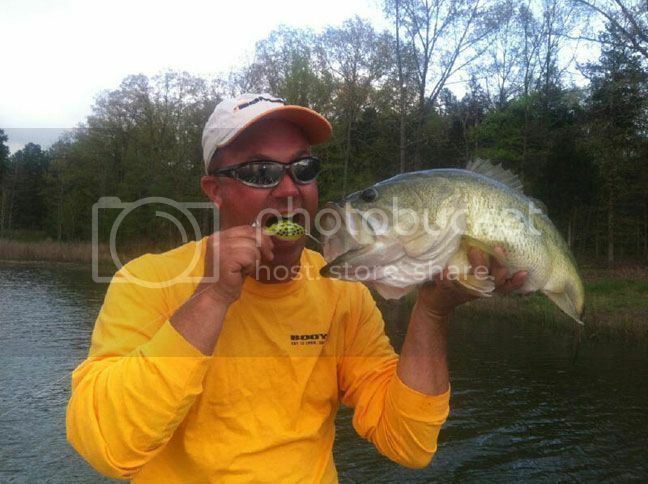 Dudley was videoing fishing tips at a private lake in Tennessee when he tied on an Arbogast Buzz Plug, a new floating lure equipped with a buzzbait-type blade. What happened next made him a believer. The “big one” weighed in at 11.4-pounds and is a personal best for Dudley, who said his previous big fish weighed a little more than 9-pounds. He was casting to shallow, cover-strewn water and saw the fish dart from the shoreline toward the bait. Dudley described the strike as sounding like a toilet flushing. The new Buzz Plug is a unique topwater bait that combines a buzzbait with a floating plug, but its effectiveness goes deeper than simply slapping a blade on a Jitterbug body. Instead of floating on the surface like most topwaters, the body of this bulbous bait sits deeper and “plows” the water, according to Dudley, creating a an action that fish can feel as well as hear. In addition to the big wake the Buzz Plug produces, Dudley says the bait provides another advantage over a buzzbait, the ability to slow down or stop when a fish strikes but misses the bait. With a buzzbait, he says, giving fish a second chance is tough. There’s a very specific time when buzzbaits are the most-effective lure you can throw, but the Buzz Plug expands the time frame and the situations when this type of lure is effective, according to Dudley. And despite its unique look, he says he’s already made space in his tournament tool box for the bait. This entry was posted in Articles on March 18, 2014 by DHopper.